Gripsweat - Modern Soul 45-Peter Jackson Band-Disco King-Phonograph-TOUGH ONE-VG to VG+!! Modern Soul 45-Peter Jackson Band-Disco King-Phonograph-TOUGH ONE-VG to VG+!! Hi everyone, this time around I've got some Soul and a few Garage 45's! 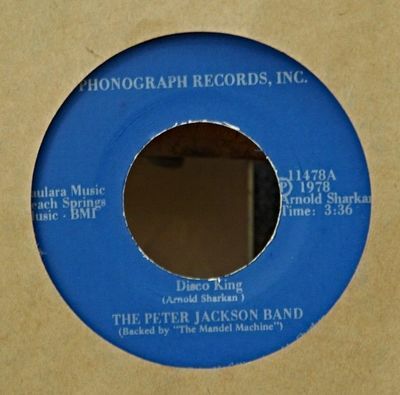 Hi, this is a US 45 by The Peter Jackson Band, "Disco King" b/w "Can You Tell Me What Day It Is", released on Phonograph 11478. This is an ORIGINAL pressing! Condition is a solid VG to possible VG+ with clean labels. Nice one! All records are professionally packaged in custom mailer boxes and protected on the inside by thick cardboard filler pads.All records are removed from the cover prior to shipment unless requested otherwise or still sealed. Shipping discount for multi-item purchases. All grading is visual unless noted. Tracking is included on all US orders. Check out my other items! Be sure to add me to your favorites list!